"Come ho imparato a volare" is a journey through the nature of the things, it's a project that aims to reflect upon the sense of beauty, dealing with the common fear and phobie of death and destruction. For this project I recorded the sounds of larvae (Sarchophaga Carnaria) during their transformation into flies. Through rough, sub-real field recordings, I explore, interpret and lyrically re-invent the concept of metamorphosis. For the composition I also used field recordings made during the rites of the eastern procession in the South Italian town Castellaneta (Taranto), where my father was born; in particular I used the women's choir (Coro delle Pie) that harrowing sings the life and death of Christ. The women's choir in fact embodies the special role of link between audience and procession, which is since always performed only by male actors. The spirit of such a “street-theatre” is in the meantime sacral and profane, a theatre that aims to represent and exorcize the fear of the corporal death. Therefore I interrelate the sounds of larvae and flies with the sounds of the eastern procession, thematizing the resurrection as metamorphosis of an imprisoned creature into a sublime being, that learns to be free and fly. 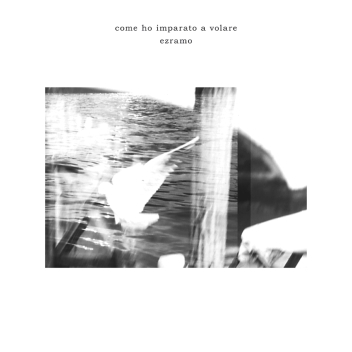 A truly uncategorisable item is Come Ho Imparato A Volare (CORVO RECORDS CORE 002) by the Italian artiste Ezramo. This is evocative, lyrical art, created by a very gifted miniaturist. 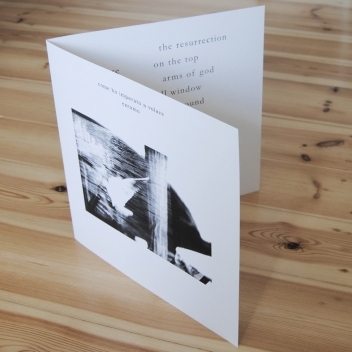 In just six short tracks we hear a bewildering variety of musical and sound-art techniques, all in the service of Ezramo's peculiar minimal-poetry lyrics; she sings, plays piano, zither, harp and bells, and also collages field recordings. She also produced the drawings and texts for the whole sleeve. You probably won't be surprised to learn that this gifted woman is primarily a gallery artist, who assisted at the 2011 Venice Biennale, and that this LP has its origins in an exhibition of the same name which was shown in 2009. In the two years following her Stuttgart success, she developed this music which I suppose (not having seen the exhibition) might be an aural rendition or re-casting of the same themes. She is interested in insects and larvae, as is Irene Moon but in a quite different way, and she intends to explore the idea of 'transformation'. All the album's titles refer to this concept, either obliquely or directly, and if you think the image of being wrapped in a cocoon is going to depict a comforting interpretation of human existence, quite the opposite. It's fairly clear that the entire experience of 'How I Learned To Fly' is sad, painful, uncertain, and even racked with torment. Despite moments of respite implied by the romantic piano fugues, the core of the work is quite insistent on these raw emotions, many of which are clearly very hard to express. I welcome this degree of honesty and truth in art, which is very rare. The printed text inside just sings to us about the painful primacy of existence, and our responsibility as human beings: 'Wake up!! 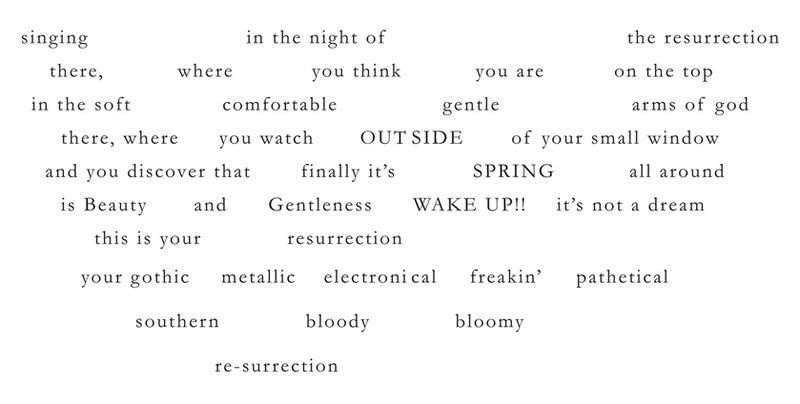 It's not a dream...this is your resurrection, your gothic metallic electronical freakin pathetical southern bloody blooming resurrection''. It's also evident that the gifted Ezramo, whose real name is Alessandra Eramo, knows exactly what effect / meaning / substance she is aiming for with each note she creates; not a single wasted moment across the entire LP, which is compact and accurate as a jet of ice cold water between the eyes. I also welcome this sort of discipline and economy in art. As to what it sounds like, besides the piano music episodes, there are two or three abstract tracks of intense hissing sounds which deliver all the tension and fear implied above; there are overdubbed vocals chanting absurdist la-la tunes in a stark manner; and an opening track that is an expressive metallic rattling episode, highly reminiscent of Ashley Paul's music. The LP ends with a collage of sound effects and field recordings that seems to depict a dramatic and near-nightmarish Cinderella story - footsteps running, voices muttering, something going badly wrong at a concert with choral music and brass music. 300 hand-numbered copies of the 'trade' edition, and 50 art edition copies which were inlaid with original drawings by the artist. Released in March 2012, this is one of the most beautiful records (aurally and visually) I have received this year. Ezramo ist Alessandra Eramo, geboren 1982 in Tarent, die durch audiovisuelle Live-Performances und Poetophonien auf sich aufmerksam machte. Auch in BA ist sie durch PopeWAFFEN, ebenfalls auf Corvo Records, keine Unbekannte mehr. Diese Scheibe hat sie aber ganz allein bespielt und mit poetischen Sequenzen bedrucken lassen, eigenwilllig und seltsam, wie wenig andere. Die Idee ist in etwa, das Leben eines Insektes zu träumen. Verbunden mit der gnostischen Urfrage: Woher? Wohin? Warum überhaupt? Man wacht plötzlich auch als Fliegenschiss im Universum, als Fliegenei, als junge Larve. Ezramo inszeniert ihre Philosophie mit Glockenschlägen auf einer präparierten Zither, Singsang, fiepender Mundharmonika, langsam pulsierender und rasselnder Perkussion. Von finnischen Schamanen- und Waldgeistschwestern kennt man ähnliche Laute, bevor sie 'Les Jeux sont faits' singt. Dann Glöckchen, summende Vokalisation und ein Brodeln im Larvenstadium. Poesie? Ist nur ein Satie'sches Intermezzo, einsam am Piano geträumt. Man träumt sich, spinnt sich, in einen Kokon, verpuppt sich, wartet auf die Verwandlung. Drinnen ist Draußen ist Drinnen - nur ein Brausen und Knacken, eine Ahnung des Schwämens, der Entfaltung. In einer kleinen, melancholischen Pianoklimperei, einem Drehwurm aus Lälälä-Singsang, der zum Chor anschwillt. Gehen, fallen, gehen, fallen. In einer Karfreitagsprozession in Trampani. Mit Blasmusik und Touristen auf den Kalvarienberg. Fliegen lernen. Einchecken. Davonfliegen ist Auferstehung, Heimkehr. Fliegen lernen heißt sich wiedervereinigen mit der Erinnerung - an das süße Nichts? Alessandra Eramo a collaboré et posé sa voix avec Fred Frith, Paul Hubwerber, David Fenech et beaucoup d'autres. Outre des compositions pour le théâtre ou la danse butoh, elle axe son travail sur la voix et le field recording. Ici, quelques enregistrements de larves de papillons se mêlent volontiers à des compositions minimales, au son très lo-fi comme issu d'un autre temps. On se croirait parfois à l'époque des pionniers de la musique électro-acoustique, en commençant par les futuristes bien sur. Il plane sur ce disque un parfum exotica, mélodramatique, cinématographique, surtout sur le piano qui me ramène facilement aux bricolages de Vitamin B12. Tout commence dans des ambiances rituelles et psychédéliques, que l'on retrouve chez Amolvacy ou Volcano the Bear. Elle sait nous plonger aussi dans un quasi documentaire radiophonique et géopolitique en enregistrant et retranscrivant une procession chantée par des femmes, dans la ville natale italienne de son père. Moment se révélant assez magique par sa prise de son brute de décoffrage. L'exercice de voix en canon ou en re-recordings, comme on veut en fait, juste que le titre s'appelle "Last Canone Before Flying" fonctionne tout autant. Et nous emmène tranquillement à cette procession, tout en délicatesse. Mini album soigné qui effleure le lyrisme, qui sait nous tenir en haleine par son charme déroutant, un disque plein d'histoires, d'anecdotes, de ritournelles enfantines, mais aussi parsemé de brouillages et bidouillages du plus bel effet. Très frais en somme. Et surtout très réussi. Ezramo has found herself present on both of Corvo Record’s debut releases. But while PopeWAFFEN calls upon her abilities to interact and improvise with a stark variety of other performers, come ho imparato a volare allows her to occupy a space all of her own. The voice she adopts in this opening statement for Corvo is a quiet one – unimposing, barely extending beyond her own audibility radius, making a subtle and modest imprint on those who wish to listen. On opener “Le Jeux Sont Faits”, plucked zither strings shimmer like the glacial bells, while blues harp and vocals veer in and out. The whole thing seems to sway unstably back and forth, with the dry and slightly lo-fi nature of the recording bringing a sort of voyeuristic intimacy to the listening experience. In contrast, the chimes and vocal hums of “Larve Giovani” feel less internalized – they sound like ritual chants from a consumed mind, reaching out for gods beyond the stars, yearning to be astrally projected out of the atmosphere. The sounds of actual larvae stirring into life are also featured on this track, and correlate appropriately with the underlying sense of spiritual awakening. These are the album’s two most expressive and interesting cuts. The following track (“Un Pianoforte Solitario”) succeeds in exhibiting another side to Ezramo – almost like a solemn, nostalgic memory of childhood, conveyed through a brittle and simplistic piano piece – but it jars with the looser forms of expression seen elsewhere, and doesn’t carry the same sense of raw emotional build-up. The unsynchronised vocal rounds of “Last Canone Before Flying” make for a similar case. Ezramo’s voice is piled on top of itself until the melody is drowned beneath a cascade of voices, descending into insignificance as each new layer competes with those before. It’s an interesting effect to begin with, but simply doesn’t penetrate with the same emotional drive. 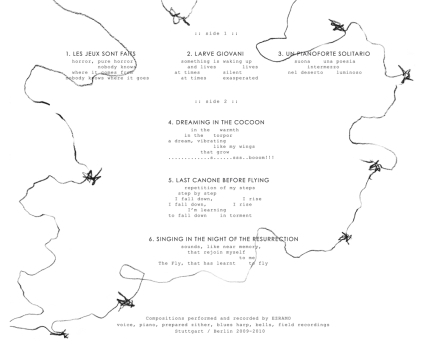 Elsewhere, the clouds of aggravated distortion of “Dreaming in the Cocoon” provide a neat interlude (reprising the recordings of larvae), while “Singing in the Night of the Resurrection” tucks the triumphant sound of an Italian easter procession inside traffic noise, public chatter and various other field recordings, taking come ho imparato a volare to a mournful close. The latter acts as a gentle departure – while it feels deeply entwined in the mind of its creator (just as with the rest of these pieces), it sounds like a mere distant memory, as though signifying the listening experience’s impending status as an object of the past. A quietly intriguing album, and a gentle success. Ezramo, das ist als sitze man in dem weiten Dachgebälk ihres Kehlkopfes, schier endlos surrealistische Adverbien durch den Raum werfend, während draußen die Sicht aus dem Fenster den Blick auf Telegraphenmasten freigibt- die Drähte derselben in knarrende Schwingungen versetzend. Eine Welt in Bewegung, kreisend um das Individuum. Im Körper einer fühlenden Frau weichen die Organitäten einer antiken Struktur, ähnlich dem weißen jungfräulichen Karton, auf welchem das visuelle Rankwerk aufgedruckt ist. Ezramos mal sirenenhafter Gesang sowie die stottrig-flexierend vorgetragenen Dadaismen formen das Basismaterial, Larven- und Feldgeräusche bilden eben jenes Dach einer vexierten Welt auf Papier, die in ihrer Intensität all jene Wünsche schürt, die zur freien Entfaltung der Persönlichkeit dienen. Wenngleich das Klavier im dritten Abteil der Platte geradezu trivial von der Wohnlichkeit der eigenen Verletzbarkeit kündet, finden sich in den angestaubten Apothekerschränkchen der Erinnerung genügend Zettelkästen zur Identifizierung des eigenen Wunschdenkens. Fliegen will Ezramo, sie hat es gelernt, ganz gutmenschlich auf jene Larven übertragen, die in ihrem zur-Fliege-werden noch gefangen sind. Der Anfang kündet von ebenjener Entwicklung, gehüllt in nestwärmende Artefakte der konkreten Welt, über all jenem das Knarren der Drahtseile, das Schwingen der Atemluft, das Vibrieren der eigenen vokalen Tonalität. Die Welt in ihren Schattierungen wird nur noch dargestellt durch die immense Verdoppelung der Stimme. Die Rückseite bietet genau das Pendant zur Umseite, der Prozess wird abgeschlossen, aus dem geöffneten Fenster weichen Protagonistin und Derivat in schönster Formvollendung. Sprachlos staunt der Mensch. Nach der äußerst gehaltvollen Kooperation “PopeWaffen“, woran sich auch die Wahlberlinerin Alessandra Eramo aka Ezramo beteiligte, publiziert Corvo Records, das Label für kontemporäre Tonkunst, die Solodarbietung “Como ho imparato a volare” der gebürtigen Italienerin, welche sie schon mancherorts live performte & nun als 12inch (limitiert auf 300 Exemplare) in schicker selbst gestalteter Verpackung materialisiert. Insekten bestimmten auch einst die Thematik auf “Nachtfang” von Novy Svet/ His Divine Grace, deren Ansatz nur das Ende von Wesen wie der Grauen Fleischfliege beschreiben, hingegen Ezramo sieht die kleinen “Biester” als ein Teil der Schönheit von Mutter Erde bzw. der Natur, weshalb sie Ihnen “Come ho imparato a volare” (HowI’ve learnt to fly) auf den “Leib” schrieb, wo die hoch ausgebildete Künstlerin den kompletten Entstehungsprozess und deren Umständen wie Gefahren von Insekten nachzeichnet, bis sie endlich frei sind & fliegen können. Wen die Hektik der Straße treibt, kann das kurze wie kurzweilige Release “Come ho imparato a volare” direkt von seiner Liste streichen, das auf freigeistigen Spuren von Piano, Zither, Glocken, Mundharmonika, Gesang und Feldaufnahmen beruht, die gemeinsam einen Soundtrack bilden, der das Leben der Grauen Fleischfliege musikalisch vor Augen führt. Vor allem die Feldaufnahmen verleihen diesem Werk einen besonderen Charakter, wo die Italienerin Aufzeichnungen einer Osterprozession in Castellaneta (Italien) wie die Geräusche der Grauen Fleischfliege verwendete, um ihren Inhalt eindrucksvoll in den Ohren der Konsumenten zu “veranschaulichen”. Gewisse Mischungen hören sich nur gewagt an, “Come ho imparato a volare” hingegen ist speziell und dürfte nur Individuen zusagen, deren Horizont nach Musik beginnt und tief in der Kunst endet. Aus engmaschigen Konzeptarbeiten wie “Come ho imparato a volare” lässt sich kein Anspieltipp herauskristallisieren, aber die Erkenntnis gewinnen, dass nur Hördurchläufe ohne Boxenstopp das wahre Erlebnis bescheren. Alessandra Eramo aka Ezramo schenkt den kleinen “Plagegeistern”, die so manchen in den Wahnsinn treiben, mit “Come ho imparato a volare” eine Art “Denkmal”, das anschaulich ihren Weg von der Larve hin zum fliegenden Insekt aufzeigt und im übertragenen Sinne den Freiheitsgedanken impliziert, – meine absolute Empfehlung! PS: Wem Interpreten wie Stockhausen, Kommissar Hjuler & Co kein Greul, sondern ein Heil sind, muss “Come ho imparato a volare” von Ezramo sein Eigen nennen! Eine spezielle Geschichte der Befreiung erzählt die junge, in Berlin lebende italienische elektroakustische und bildende Künstlerin Alessandra Eramo aka Ezramo auf dieser um nichts weniger als wunderschönen Platte. Auf „Come ho imparato a volare“ (Wie ich fliegen gelernt habe) spielt Ezramo mit Stimme und Klavier, mit den Klängen von Zither und Glocken – und mit field recordings von Larven während der Entwicklung zur Fliege einerseits und einer süditalienischen Osterprozession andererseits. Was heißt gespielt? „Les jeux sont fait“ heißt es zur Klarstellung gleich im ersten Stück. Und am Ende fliegen die Fliegen befreit aus dem Zimmer. Diese Larvengeschichte erinnert die Cineastinnen unter uns fast zwangsläufig an „Das Schweigen der Lämmer“. Nur dass hier die Metamorphose nicht spekulativ in Serienmorde mündet, sondern – in Gegenüberstellung mit den Ostergesängen von Frauen, die in einer der Hochburgen des Patriarchats eine untergeordnete Rolle spielen – den Tod eines Wesens und seine Umwandlung in etwas anderes, von mir aus höheres thematisiert. Jenseits von der konzeptuellen, auch politischen Ebene funktioniert „Come ho ...“ gleichermaßen auf der ästhetischen. Poesie unter radikalem Kitschverzicht, die eben deshalb die Seele der Musik offenlegt – das gelingt Alessandra Eramo, deren aktuelle Arbeit „Poetophonie“ ab 4. Juni bei der Biennale Venedig zu sehen ist, ganz vorzüglich. Erst die zweite Platte der blutjungen Berliner corvo records und schon so ein großer Wurf! Pierwsze wydawnictwo z Corvo wydawalo sie szalone i ekscentryczne, ale solowa plyta wloskiej wokalistki Ezramo granice szalenstwa przesuwa jeszcze dalej. W czasie nagrywania tej plyty jej studio musialo przypominac laboratorium szalonego biologa - glówna tkanka, z której powstaly utwory byly nagrania larw cmy z gatunku Sarchophaga Carnaria. Nie wiem czy nazwa gatunku jest istotna, ale byc moze ma wyjatkowy wplyw na brzmienie gestych, niezwykle organicznych podkladów, na które Ezramo naklada kolejne sciezki budowane z dzwieków akustycznych, jak chocby cytry w pierwszym utworze, która z dysonansowych struktur przeksztalca sie w jedna z warstw niby piosenki gdy wchodzi coraz bardziej melodyjny glos. Nieraz odglosy larw towarzysza jedynie warstwom szumów subtelnych, wilgotnych i cieplych niczym mech. Skrajny niemal minimalizm kaprysnie rozwija sie, zageszcza by czesto zatrzymac sie krok od zorganizowanych, poukladanych struktur. Plyta trwa niespelna trzydziesci minut, ale to bardzo dobry czas by w pelni docenic ta muzyke i czuc mily niedosyt. On se souvient d'Ezramo (dans le civil, Alessandra Eramo, Italienne installée à Berlin) pour Popewaffen enregistré en concert avec Wendelin Büchler, David Fenech, Gino Robair et Argo Ulva, que produisit Corvo Records. Le même label sort aujourd'hui Come Ho Imparato a Volare (comment j'ai appris à voler). Si l'oiseau Ezramo a pris son envol, elle règle ses mouvements sur ceux de Fenech, par exemple. Amatrice de pop gentille (bien qu'expérimentale et atonale), elle siffle son folklore minimaliste à travers une cithare, un piano, des field recordings et les clochettes de Mama Baer. Parfois on regrette un mélange de voix ou une psalmodie naïve, mais d'autres fois les chansons d'Ezramo trouvent une place au chaud dans un nid grouillant de larves : c'est là que cette pop étange prend tout sa saveur ; là qu'elle touche au coeur en vous le retournant.